Delangre sits at the helm of a company that was started over 40 years ago by one man with a mission to educate people on the health benefits of a high mineral sea salt. Salt, of course, is a commodity that people around the world are familiar with; in homes everywhere, salt shakers reside on dining tables and kitchen counters, and recipes call for various measurements of this savory mineral, a pinch of salt here, a dash of salt there, all ways of adding to our culinary experimentation and enjoyment in efforts of enhancing flavor. But this everyday staple has a much deeper story behind it, and the Delangre family in Asheville has made this story their own. Over the years their company has grown, evolved, and certainly seen its share of hardships. 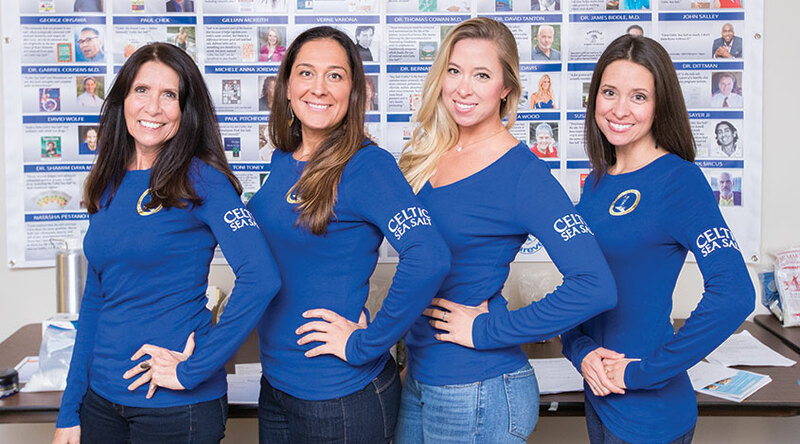 Selina, as CEO of Celtic Ocean International, Inc., the parent company of Selina Naturally and the Celtic Sea Salt brand, feels that she was destined on this path. She and the company have persevered through financial hardships, business relocation across the country, divorce, floods, deaths, and lawsuits. Instead of throwing in the towel, they have risen above each challenge with the gusto and enthusiasm needed to survive—traits that flow from Selina’s personality. Celtic Sea Salt is often assumed to be a specific type of sea salt, but, in fact, it is a brand that was created in 1976 in Chino, California, by Selina Delangre’s father-in-law, Jacques Delangre, who founded a company he called the Grain and Salt Society. He was a pioneer and leader in the salt industry at a pivotal time in the country. For years families had been gravitating towards mass produced items that held decreased nutritional value, salt included. Jacques entrenched himself in the study of macrobiotics, a more mindful way of consumption that emphasized knowledge of where food comes from and how it is harvested. Years of research and relationship building with leaders in the field of health and wellness led him on a journey into the salt world, and on a quest for the best sea salt he could find. He recognized the potential benefits of this precious mineral and knew there was a rich history and culture in the harvesting methods that had waned over time. Jacques subsequently came across a small community off the northwest coast of France that had long been a great source for harvesting sea salt, but the lack of interest, knowledge, and financial support had taken its toll on this ancient tradition. To Jacques—and to the salt farmers who had made this their livelihood—salt harvesting was an art, and this region was the perfect landscape to provide the necessary ecosystem for optimal sea salt. Ancient salt ponds were lined with a rich clay that was thought to provide a higher concentration of minerals, and thus increased health benefits. Mindful of all this, Jacques started bringing back suitcases full of this beautiful gray colored salt, selling it to friends and family by the pound. He called it Celtic Sea Salt because it was the Celts that would harvest this way over 2,000 years ago. Based on his research and findings, he wrote a book titled Seasalt’s Hidden Powers that turned out to be the catalyst for an explosion into a society that at the time was embracing a kind of “health revolution.” People were hungry for information, and in this pre-internet era, influencers of the day included doctors and researchers who were reaching large audiences via newsletters. These newsletters, with subscribers numbering in the tens of thousands, started disseminating information about Jacques and his book. In one newsletter, written by Dr. Bruce West, who had around 85,000 subscribers, Jacques and his small salt company was mentioned with a claim that if you sent them $5, they would send you a bag of salt. Not long afterward, when Jacques and his wife, Yvette, went to the post office, there were close to 40 white bins lined up with envelopes that had $5 bills in them. Overnight, the company went viral—“viral,” in a late ‘70s era, old-school type of way. To answer the sudden demand, Jacques and his wife went to the grocery store, bought plastic baggies, figured out how to make labels, and started sending their product to their eager customers. Because this type of salt harvesting was a dying art, they were concerned that their supply would not keep up with the demand, and they needed a way to ensure the farmers would have consistent orders. Jacques’ solution was to create a club with a membership structure so that his customers knew they were getting their product, and also that the farmers knew there was a reliable demand and a stable profit. He called this the Grain and Salt Society. This trend took on a life of its own and has continued to grow over the last four decades. The concept of sustainably harvested and mineral-rich sea salt struck a chord with consumers, and as a result, the artisanal salt farming industry was rejuvenated. In 1992, Jacques, who had been born with a heart defect, suddenly passed away while shoveling snow. Devastated by the loss of her husband, and without the ability to efficiently run the business, Yvette turned to their son, Philippe, and his wife, Selina, who soon packed up and, with their three children, moved from Florida to Chico to assist Yvette in the running of the business. Interestingly enough, having been afflicted with migraines when she was younger, Selina had become suspicious that her health issues could be food and nutrition related. Over time, she gravitated toward healthier foods, the opposite of what she had grown up with as a child in Indiana. After moving to California, she fully embraced a new age lifestyle, with a focus on healthy living. As she now explains, “It wasn’t like I woke up one day and wanted to get into the salt business, or even the natural products industry.” Her life had led her to this opportunity, and it just felt meant to be. She says that even her name means salt (“salt” translates in French to “sel”), and she truly believes that it was her destiny to become a part of this business and this culture. After jumping into the business that Jacques had built, Selina quickly realized that people wanted more information. She was fielding questions on all sorts of health and nutrition related topics, so the company started its own newsletter, called A Grain of Salt Newsletter, and it was distributed to 20,000 people. This newsletter was addressing a wide spectrum of inquiries and topics, but at its very core was the magnificent benefits of Celtic Sea Salt. This relationship-building laid the groundwork for the success of the business. Selina says they didn’t have to advertise because they were educating through writing. Her tactic was to find people in the natural health industry who had a book or a platform, and develop a relationship with them. Today, Celtic Sea Salt is mentioned or featured in over 700 books. This all stemmed from that immensely popular newsletter—plus a product that they firmly stood behind. Explains Selina, “We have a commodity that just makes sense to talk about because everyone uses salt, so it is really easy. The salt company just started going viral through relationships. Could I do the same thing with wheat or ice cream…? I do not know.” She attributes the wild success of the newsletter to the concrete nature of snail mail. Their customers had a tangible reference, and she says that even today they still have people contact them for replacements of certain volumes. The origin and growth of this company was organic. The timing was right, the product was desirable, and they built a solid market. But as any successful business owner knows, there are always changes that threaten to rock the boat. One such challenge was the 1996 decision, made shortly after buying the business from Yvette, to move from California to North Carolina. This was no small undertaking. One of Selina’s children was a special needs son, and it was important for the family to find a location that better suited the family’s purposes. They settled on the beautiful mountains of Western North Carolina, and bought a warehouse building off Swannanoa River Road in Asheville to house the Celtic Sea Salt business. This move was definitely a leap of faith. “Everyone that was counseling me said, ‘Don’t do it; you are going to go under.’ I said, ‘I’ll show you—I won’t.’ So, I saved and saved to have enough cash money to make the move and I did it anyway,” Selina recalls, with a triumphant tenacity. They brought two employees from California just for the training, and hired new employees. It was a rocky start. They had limited space, all new software, all new computers, and a new staff. The orders were coming in and the steep learning curve was a reality check. Through a glitch in the system, they were accidentally shipping out three orders to every customer. This is one of the many mistakes that they can now laugh about, and Selina jokes that they have always been extremely forgiving. The company was able to get on its feet, but there was still a tumultuous road in front of Selina. She and Philippe eventually found themselves going through a painful divorce, and once finalized, she decided to buy out the company from her husband. Shortly after, her son, who suffered from cerebral palsy, passed away at the age of 28. Around this time, she was also hit with a brand infringement lawsuit from a competing company. Even though her father-in-law coined the term Celtic Sea Salt and she owned the intellectual property, this opposing brand took the name Celtic Sea Salt to the U.S. Supreme Court in order to make it a generic term that they could use on their packaging. Running low on funds, Selina decided to settle the suit—it wound up costing her $92,000—and was becoming painfully aware of the cutthroat nature of big business. The popularity of her brand was both a blessing and a curse. With the rise of the internet, companies around the world were encroaching on her hard-earned family business name. Never one to shy away from a challenge, Selina chose to focus on building the brand, something she could stand behind and fight for. And she has fought for it every step of the way. In 2004, shortly after her divorce was finalized and her lawsuit settled, Selina was in France on business when she got a call from her sister, the CFO of the company. In the aftermath of Hurricanes Frances and Ivan there had been significant flooding in Asheville. The proximity of their building to the Swannanoa River rendered them vulnerable to the swift rising water, and the entire warehouse was now housing over five feet of water. Everything they owned was ruined by the muddy, wet mess. The one saving grace was that their computer server was housed on the second floor, and they were able to recover their database. As Selina relives this memory, the devastation and shock still twinge like a fresh wound. Yet her optimistic side revels in the positive aspects of this tragic event. Friends and employees donated their time to help salvage anything they could. The relationships that Selina had worked so hard to build were paying off, and a real sense of camaraderie and community emerged. The company had already made plans to move into a new warehouse in Arden, off Brevard Road, that they had purchased, but they had not yet gotten the approvals and certificate of occupancy. Now, with Duke Energy workers being called to New Orleans to help with Ivan-related flooding, there was little hope that this move would happen anytime soon. Selina went to the FEMA office and waited in line for hours to ask for assistance, only to be told that they could only help her if she had a business plan. Determination set in, and right then and there she took a piece of paper and outlined her plan. Her plan was to drop the mail order business and start getting her products into stores. She detailed the ways in which she was going to do that, and eventually she was able to get a two percent interest loan of $480,000 from the Small Business Administration. “It was almost like a gift from God to start all over,” she says. But her loss wasn’t over yet. Selina was crushed, but she turned to her spiritual side for guidance, and held onto the belief that he was still with her and had the power to help her get through this trying time. This belief would manifest itself in the form of a man named Cookie Mills. Stuck in a building without power and her business hanging in limbo, Selina was in her office one day when, out of the blue, the gentleman showed up and informed her that he was about to retire from Duke Energy, and although he was supposed to be going to New Orleans, he said that God told him there was a lady here that needed his help. After finding out that power would not be restored for at least eight more weeks, Cookie called in some favors to the energy company, and was able to get it restored that evening. Selina admits the story is unbelievable, and that if there hadn’t been witnesses, the truth would be in question. But she is certain that her friend and mentor was sending help at the exact time she needed it, in the form of Mr. Mills, and that this act most likely saved her business. This has been the story of Selina’s life. Every time she has been delivered a heart-wrenching, potentially life-altering blow, something miraculous has come out of it. To say she has surmounted obstacles in her life is an understatement, but she is adamant that she doesn’t relay these as victim stories. She never obtained a business degree, and she confesses that she made terrible grades in school. She has gotten to where she is today by following her intuition and taking risks. Some of these risks have paid off, and some have cost her money and emotional distress, but as is often the case, so goes the life of an entrepreneur—by definition, a risk-taker. This life and business in the pursuit of salt is no ordinary one. Selina is continuously educating herself and her customers on the qualities of this commodity. This means she frequently travels in search of salt flats that produce a quality and ethical product, keeping with the example that Jacques set so long ago. The overall concept and mission of the company remains the same, but Selina has certainly made it her own. Realizing that the original salt source in France was too limiting to rely on totally, she has spent many years in search of other sources around the world, including Spain, Hawaii, and Mexico. She has found that the essential minerals found in sea salt were not actually derived from that gray clay. People from all over the world send her samples of their salt for her to test in her lab. She is looking for the same features and benefits that Jacques wrote about in his book. What sets sea salt apart is the reduced level of sodium chloride. If it is harvested correctly, this reduction leaves room for the beneficial elements of magnesium, calcium, and potassium. Selina tests every one of their salts for these properties, and keeps detailed documentation for comparison. She personally visits each salt flat to ensure that all quality standards are being met, and is currently in the process of visiting sites in hopes of purchasing one of the flats herself. This will guarantee her control over the process and the product. Additionally, she and her team of specialists continuously search for new harvesting practices and products that will give them an advantage in a competitive industry. Although a profitable business is certainly the end goal for Selina, her passion lies in the product. For her, the journey and the discoveries are what keep her going. Selina is approached by a wide spectrum of people, and hears her share of outlandish questions and ideas, but a recent contact in an unlikely arena has piqued her interest. A woman reached out to her with a story about one of her horses. This horse, a prized and expensive race horse, had fallen ill. It was refusing to eat and its health was quickly deteriorating. The vet warned that if there was not a change soon, the outlook was not good. After recently visiting her own doctor and having been recommended to use Celtic Sea Salt in her diet, the woman examined the bottle as she was eating one day. Suddenly, she got an idea. That day she put a tablespoon on the horse’s food. Two hours later the food was completely gone. Within a month they had developed an entire equine line that is in the process of being distributed to big name stores such as Tractor Supply. The owners even renamed the horse Celtic Sea Salt because it has won every race since. This new, unexpected revenue stream could be a welcome boost for Selina and her company. The timing of the equine line couldn’t be better. The company traditionally sold directly to consumers, but over time, large companies will only purchase through distributors. This has been a huge shift in the process and the profits for the business. To offset costs, Selina has tried tactics such as automation, but found that she was sacrificing the quality that was the foundation of her business. She has learned a lot along her journey through trial and error. The business started as a family business, and this concept couldn’t be truer today. When Selina contemplates the future of the company, she thinks about retirement and she thinks about her kids. Both of her daughters work for the company, as well as her niece, the granddaughter of Jacques. This family emphasizes innovation, too. While the daughters and niece each play different roles in the company such as marketing and PR, they each also have their own businesses. Daughter Carla and her husband, George, focus on the culinary aspect of the business with organic coconut products. Her other daughter, Colette, has created a successful skin care line called Rare Body. And her niece, Stephanie, produces and packages Baobab and Moringa (natural super foods) from a farm in Senegal. Selina fosters each of these endeavors. All of their products are sold through Selina Naturally. “That is my first little circle of supporting entrepreneurs. We are all here under the same roof and are making it and doing it,” Selina says. Her goal is to grow the company as much as possible and sell it when she is ready to retire, with hopes that all of her family members will have successful enterprises of their own. Each of the kids have memories of going to trade shows at a young age, hiding under the table, and making their own little samples to sell to customers. They remember their grandparents fondly and are inspired by the mission that was instilled in them from the beginning. “We have always been a team, and I think our future is always sticking together and keep doing what we love, and hopefully the industry will support that,” says Carla. The pride that Selina has in her company and all of her family’s ventures is evident as she describes each of them with amazement at all of their accomplishments. Vulnerability and self-doubt are no strangers to Selina’s life. She admits that often she doesn’t know what will happen next. Yet this lends to the infectious nature of Selina’s charm, and has led her to grow a business based on passion and intuition. Selina may not know what is next, and she knows that there are many things you must sacrifice in life and business, but quality is not one of them. She will continue to search for the perfect salt that is harvested with mindfulness and sustainable practices. The proof is in a product that has a life of its own, one that people love and appreciate for its natural wonders.